Male has higher pitched voice. Description: A mallard-sized duck with a slim body, long neck, and a gray bill. 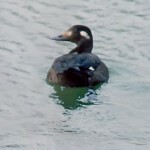 The male has a distinctive long pointed black tail, gray body, and brown head with a white streak pointing up the side of the neck. The female is slim, a nondescript mottled brown, with shorter, somewhat pointed tail. Females are notably smaller than the males. Behavior: like other “dabbling” ducks, it obtains its food by tipping up in shallow water. Engage in “pursuit” flights in which males aerially chase a female. Food: seeds, invertebrates, waste grain. 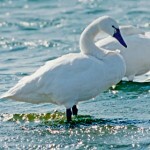 Habitat: During migration, most frequently in large expanses of shallow, open wetland habitats such as the Rainwater Basins where they are abundant. Occasionally, lakes and reservoirs. Pintails are less common during the breeding season, found primarily in Sandhills and pothole lakes and ponds surrounded by hay meadows or grassy hills. Where in Nebraska: found in appropriate habitat statewide, but especially the Rainwater Basins and Lake McConaughy during spring and fall migration, and Brown and Rock Counties during spring migration. Sandhills lakes in Cherry, Sheridan, and Garden Counties during breeding season. 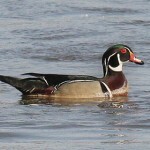 Nebraska seasons: winter, spring migration, and summer resident across the entire state. Among the first ducks to arrive and depart Nebraska in the spring. 30% of North America’s Northern Pintail population stops in the Rainwater Basin region each spring. Northern Pintails have the largest breeding range of any duck in North America. Most of Nebraska’s Pintails breed in the Prairie Potholes region and winter along the Texas and Louisiana coasts. 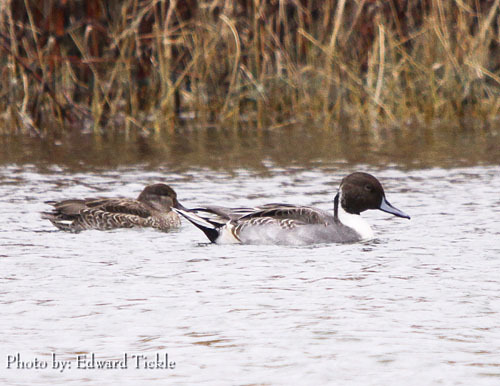 Fun Facts: Northern Pintails are among the earliest nesters beginning soon after the ice begins to melt.